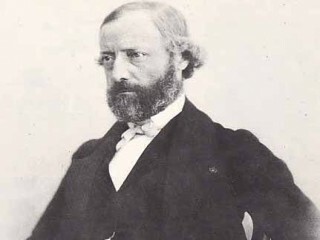 Eugène Emmanuel Viollet-le-Duc (1814–1879) was a French architect and theorist, famous for his interpretive "restorations" of medieval buildings. Born in Paris, he was a major Gothic Revival architect. Viollet-le-Duc's father was a civil servant living in Paris who collected books; his mother's Friday salons were attended by Stendhal and Sainte-Beuve. His mother's brother, Étienne-Jean Delécluze, "a painter in the mornings, a scholar in the evenings" (Summerson), was largely in charge of the young man's education. Viollet-le-Duc was trendy philosophically: republican, anti-clerical, rebellious, he built a barricade in the July Revolution of 1830 and refused to enter the École des Beaux-Arts. Instead he opted in favor of direct practical experience in the architectural offices of Jacques-Marie Huvé and Achille-François-René Leclère. During the early 1830s, a popular sentiment for the restoration of medieval buildings developed in France. Viollet-le-Duc, returning during 1835 from study in Italy, was commissioned by Prosper Merimée to restore the Romanesque abbey of Vézelay. This work was the first of a long series of restorations; Viollet-le-Duc's restorations at Notre Dame de Paris brought him national attention. His other main works include Mont St-Michel, Carcassonne, Roquetaillade castle and Pierrefonds. Viollet-le-Duc's "restorations" frequently combined historical fact with creative modification. For example, under his supervision, Notre Dame was not only cleaned and restored but also "updated," gaining its distinctive third tower (a type of flèche) in addition to other smaller changes. Another of his most famous restorations, the medieval fortified town of Carcassonne, was similarly enhanced, gaining atop each of its many wall towers, a set of pointed roofs that are actually more typical of northern France. At the same time, in the cultural atmosphere of the Second Empire theory necessarily became diluted in practice: Viollet-le-Duc provided a Gothic reliquary for the relic of the Crown of Thorns at Notre-Dame in 1862, and yet Napoleon III also commissioned designs for a luxuriously appointed railway carriage from Viollet-le-Duc, in 14th-century Gothic style (Exhibition 1965).